Today was a beautiful day. It is one of those spring-like days when it is hot in the sun and cold in the shade. Yet, the last week’s frost has me on guard. My established kale and romaines handled it like champs, however the tender window tomato and cilantro that I sprouted on a whim would not have fared well. These were, like they tend to do, outgrowing their small pot of earth in the window. They were getting too tall as they reached for the direct sun that only shone for about an hour each day on their soft photosynthetic bodies. My kitchen window is in a dreary sunless location. Outside there is this strange phenomena of hedge mustard greens that have proliferated my entire yard. Today, I took armful after armful and layered the compost bin with their nutritious selves. I’m not following specific script, just experimenting with the innate knowledge that has collected over the past two decades of study and the newly acquired snippets from some new friends who are teaching me about permaculture. I layered the compost bin with some paper bags I had to acquire from the grocer when I forgot my reusable bags. (To be honest I will always have paper bags to use as layers because I am terrible at remembering to get the reusable bags out of the car!) The bags made a great layering system and I topped them off with more armfuls of the greens to add weight and moisture. I set aside the tender greens in an orderly pile as I cleared the ground. Who ever lived here before had treated the ground wonderfully and the soil is rich and ready to provide. When I pulled apart the roots of my tender young window plants, I had to work quickly. Too much exposure to the sun would damage them beyond repair. Each one got into the ground at a good distance apart, although once they get established again I may have to thin them out as they aren’t spaced far enough apart for optimal growth. This is an experiment and I still have time to plant seeds should my plans go awry. The threat of another frost hung heavily as I looked at my baby plants, lonely in the sea of brown rich soil. 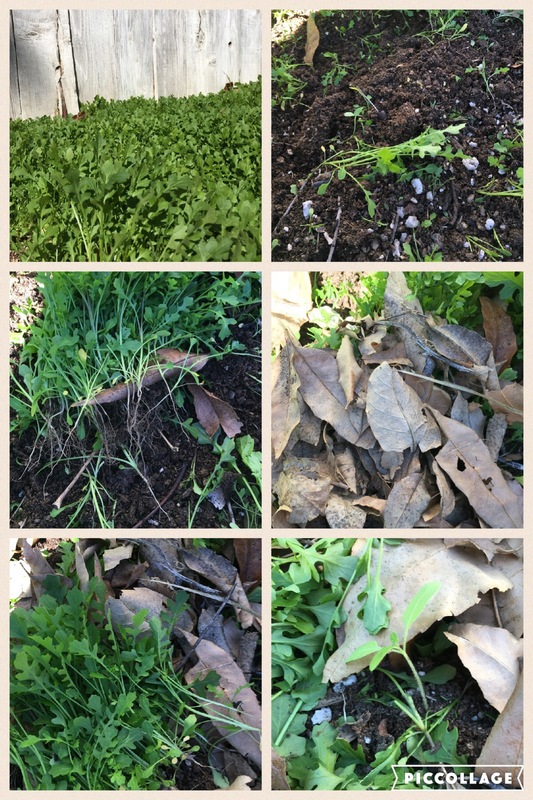 The orderly piles of hedge mustard caught my attention and I placed them, roots exposed, around each of the plants. I created small markers out of the giant seed pods from the tree that sits over the entire yard so that I would know where my plants were as they quickly became lost in a sea of green nutritious abundance. I hope that the sun will destroy any chance of these mustard plants taking root. Some plants, sub as crab grass, can overcome such exposure but the baby hedge mustard greens are almost as tender as the plants I want to grow. Still, this did not seem to be enough coverage. Then I became aware of the crunching below my feet and looked to see the pile of brown noisy leaves that had accumulated in the corner from the great winds of the last weeks. These leaves have come from some other yard’s trees; generously provided beautiful biomass that my garden needs for my ideas to become realized. I added a layer of leaves to the tomato and cilantro plot. The leaves seemed as if they wouldn’t stay long once the wind returned so I pulled up more handfuls of the hedge mustard and added a weighty layer just as I had done for the compost bin. I’m pretty satisfied with the little outdoor house I made for the seedlings. The layers already seem to be absorbing warmth and this cozy blanket should be enough to keep the seedlings from being affected by the frost should it return. Here in Southern California, and especially in my little micro environment here by the hills above UCR, I don’t think we will be hit by a hard frost. I could be wrong and Winter may make one last hard Push before Spring “breaks his back”, but if that is the case I will have created an abundance of nutrients for some new seedlings to be planted. What are your spring fever activities? Leave some beautiful words below so that we can enjoy the coming of spring as a community.